Noise parameters are what allow you to predict the noise figure (or noise temperature) of an active device. 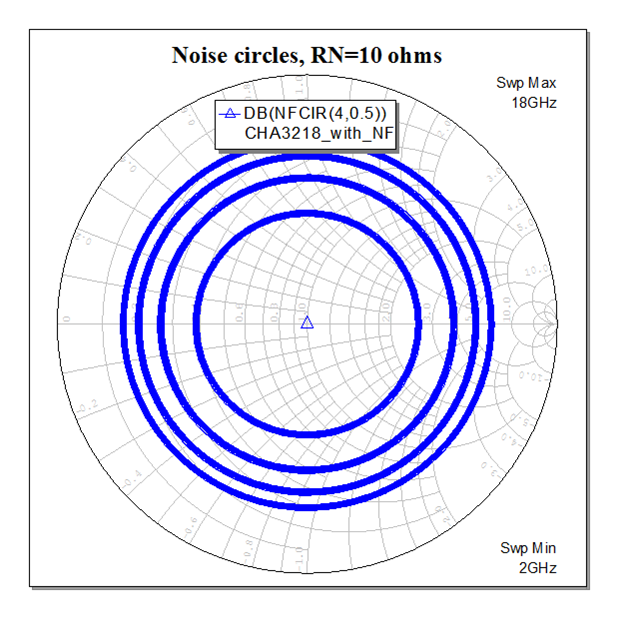 Mostly, noise parameters are left to LNA designers to ponder, but everyone that designs a receiver should have a basic understanding of noise circles on a Smith chart and what it all means. 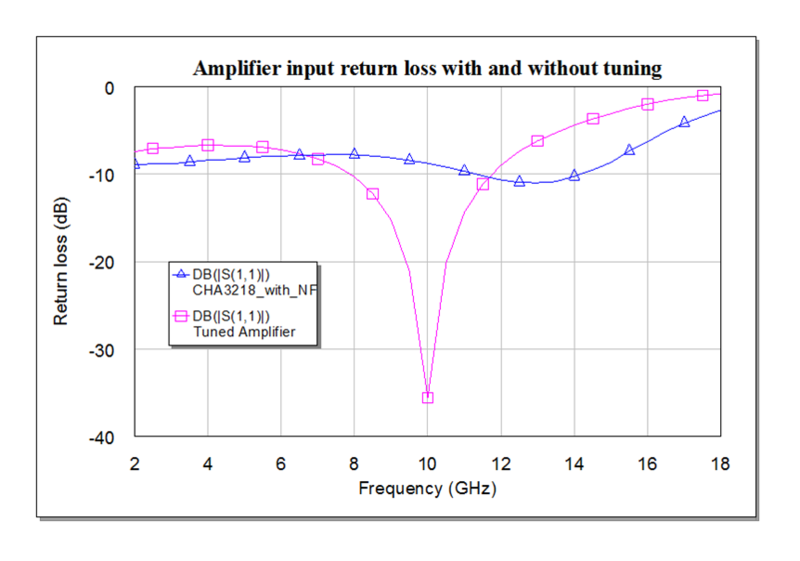 Often a system designer doing receiver cascade analysis adds in a small amount of loss in front of the LNA to take into consideration the mismatch between antenna and receiver. By coincidence the answer may be correct, but mismatch is not a simple inear problem when it comes to noise figure. Just because some of your signal is reflected, the signal-to-noise ratio in the receiver will not be affected (perhaps that statement is not quite correct, let's wait and hear from some experts before we take that to the bank). However, changing the source reflection coefficient away from fifty ohms has a predictable effect, similar to mismatch loss, in that noise figure generally gets worse the farther you go from fifty ohms. Note that it could in some cases get better! 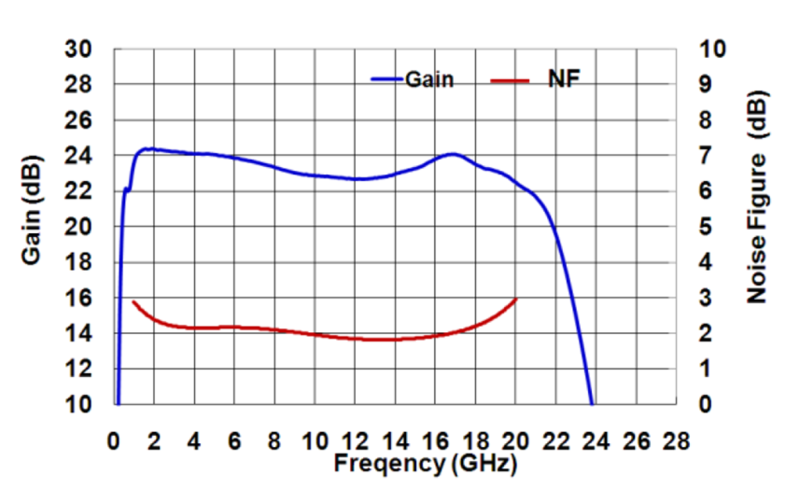 Noise parameters are discussed on this page, include Gamma_opt, Rn, and NFmin. If you consider than Gamma_opt can be a complex number, there are four noise parameters. The first part of this example is how to fake noise parameters for an LNA. This is necessary for two reasons: LNA manufacturers typically don't supply noise parameters, and it would be an expensive proposition to measure them correctly (see source pull page). Want to guess where Gamma_opt is? There is no reason it will be exactly fifty ohms, but the probability is highest that it is fifty ohms (much higher than, for example, 0.9 magnitude at 90 degrees). So always use magnitude=0, angle=0 for Gamma_opt when committing fakage. What about NFmin? Chances are it is slightly lower than the measured noise fugure in fifty ohm system, but we have no way to know how much less, the same way we don't know where Gamma_opt is. If we use the measured NF at 50 ohms in place of NFmin, at least that one single point is correct (because we set Gamma_opt to fifty ohms). Last, what should we use for RN? RN is what controls noise figure increase with mismatch from Gamma_opt. A higher value of RN means a steeper slope (and a bigger problem for your receiver). We'll show you two plots illustrating this, a little farther down the page. Now we need to choose an LNA. 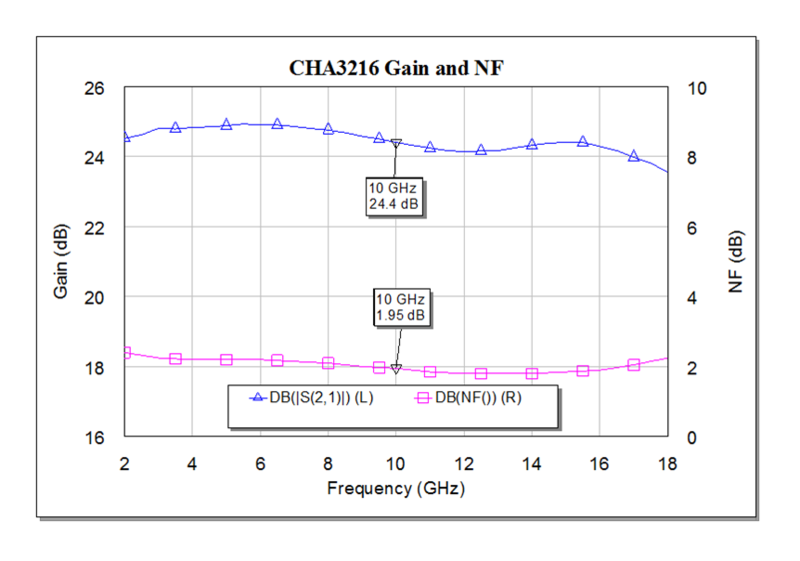 For this example we picked United Monolithic Semiconductor's CHA3218 design, it is a wideband LNA with 2-3 dB nosie figure. Grab the S-paramater file from the manufacturer's web site. We'd point you there but UMS has not yet paid their Microwaves101 utility bill. The next step is a little painful... you neeed to go the the CHA3218 data sheet and look at the tiny plot of noise figure and convert it to numerical data versus frequency. Grab a coffee, and or smoke another blunt if you are in Colorado... below is the tiny noise figure plot magnified through the twin miracles of screen capture and power point. By the way, as anyone under thirty years old will tell you, "there's an app for everything". You no longer have to "unplot" the noise figure versus frequency data, you can go to a web site to do it. Now it is time to modify the manufacturer's data file (Touchstone S2P file) to include noise parameters. Below are the data that must be appended to the S2P file. The first column is frequency (here in GHz, as defined by the "#" statement at the top of the S2P file). the second column is the NF data we read off of the tiny graph. Feel free to check our work. The next two numbers are Gamma_opt (0,0) in magnitude and angle format. Finally, the last number is RN, normalized to fifty ohms. In this case we picked RN to be 20 ohms, which is a typical value for an LNA, judging from a few weeks of experience in faking noise parameters. If you have any data on LNA noise parameters. email it to us and we will post it. By the way, the best way to obtain noise paramaters is to be the designer of the LNA, then you can get these data from your linear analysis tool. As in any vector space, reference planes matter, as soon as you allow Gamma_opt to be anything other than Z0 (50 ohms). Below we used Microwave Office to plot the gain and noise figure of the amplifer. Compare the NF to the data sheet and you will see we did quite well! Here is the input return loss as well. It is a pretty good effort, remember, this is a wideband design and wideband matching networks are tricky and always a compromise. Now let's look at the amplifier's noise circles. The first plot is for RN=20 ohms, in the second one we changed the S2P file to RN=10 ohms so you can see the difference. 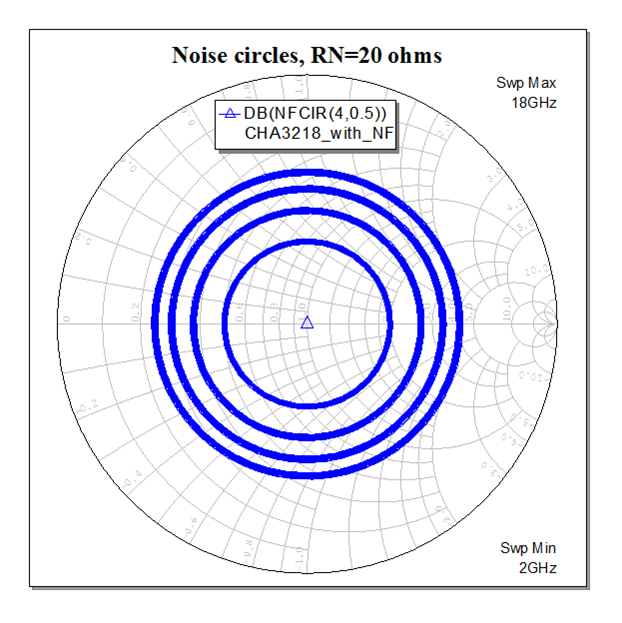 The circles in both plots are steps of 0.5 dB; the center dot is Gamma_opt, which in this case is the measured noise figure that we are trying to achieve. Note that it is only because we faked Gamma_opt to be fifty ohms that the noise circles lay on top of each other, otherwise the plots would look like Lawrence Welk's soap bubbles and we would be forced to look at one frequency at a time. Note that higher RN means steeper slopes. Obviously, Mr. MMIC designer, it would be better if you could design an LNA where RN was reduced, but this is not an easy knob to turn and you must accept that RN is 20 ohms or more. At RN=20 ohms, by the time the amplifier sees a 2:1 mismatch, the noise figure is increased by 2 dB which is far greater than so-called mismatch loss alone. This is something you need to share with Mr. System Designer when Mr. Antenna Designer is presenting his antenna design's input return loss! This also presents a philosophical question: when you put all the pieces together in a radio or radar, and you come to learn that the receiver has an extra 2dB in noise figure no one planned on, how does the link actually close or how does the radar actually find its faraway target? It's because Mr. System Designer was lying to you all along, he kept that 2 dB hidden in his pocket. If he didn't pad his calculation, it must be his first design and it is not likely to end well for all involved. By the way, this is a major problem in phase array antennas that don't employ ferrite isolators in front of LNAs, antenna mismatch with scan angle can be horrendous. Now let's try to tune the amplifier for good return loss at the center of the band. Sounds like a noble plan for an X-band design that for some reason is stuck using this wideband LNA, perhaps your boss told you you had to use up some inventory. Below is the hierarchical circuit in Microwave Office showing we added an input circuit. Here is the improved match in purple, plotted with the original input match in blue, a good result if you ignore noise figure. That was too easy! What happned to noise figure and gain? See below. 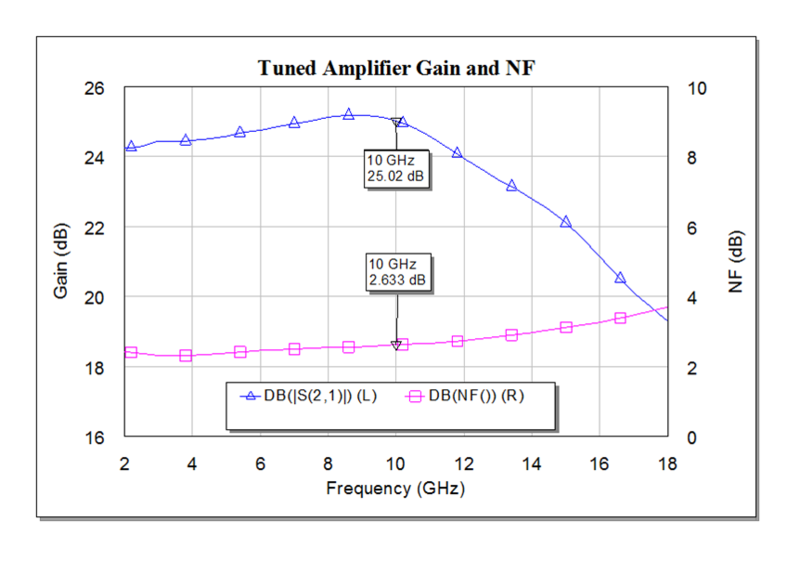 Gain is ~1 dB higher, but noise figure is increased by 0.7 dB. Ooops! What are the lessons here? First mistake, don't use a wideband LNA if you are designing a narrow band system. Second, noise parameters are needed in a system design to understand what is actually going on... don't put all of your faith in cascade analysis, that is best used for an initial look at system design but is insuffient for detailed design work. Third, good system designers always pad their component specification flowdown.